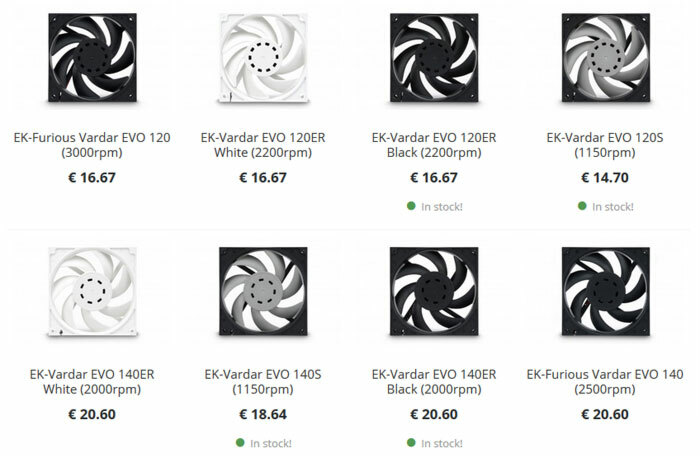 EK Water Blocks has launched a new range of EK-Vardar fans featuring start-stop functionality. These extended range PWM fans are being made available in 120mm and 140mm sizes, in various colours and with various maximum RPM speeds. 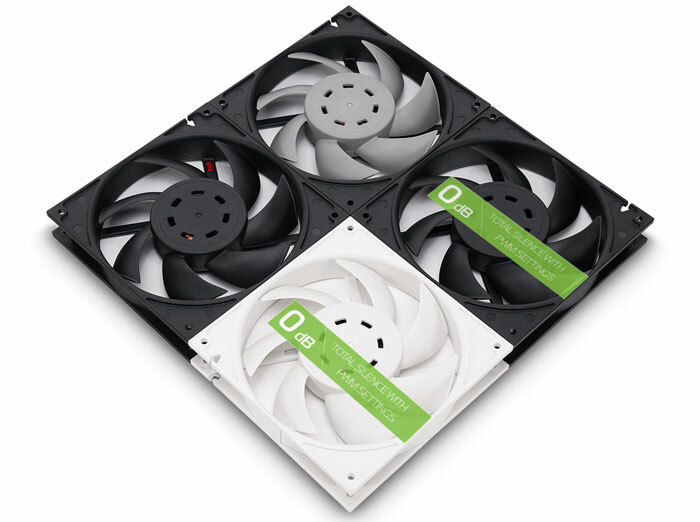 The new EK-Vardar EVO fans with start-stop functionality can help bring a "true 0dB experience" to your PC usage. EK says that as well as the benefit of a quieter environment the start-stop feature prevents dust build-up in idling PCs and extends fan lifespans. 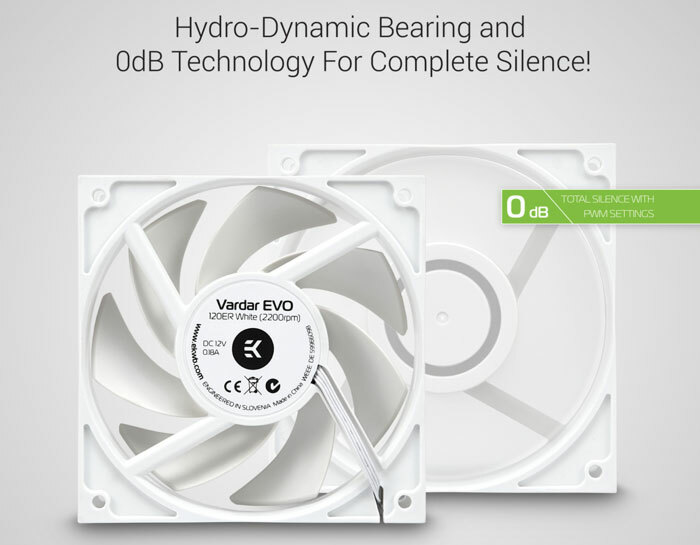 Please note that not all the new EK-Vardar EVO fans feature 0dB tech, only the ones with the 'ER' suffix. In a press release sent to HEXUS, EK explained how its new EK-Vardar EVO (ER) fans decide when to stop spinning: "If the PWM curve is set so that the PWM duty cycle is below 25-30% PWM (depending on motherboard model) the fan will simply stop spinning. If the PWM duty cycle is raised by the fan control software, the fan will spin up once again." These new fans are built specifically for liquid cooling systems, namely radiator cooling, rather than as general purpose system fans. However, EK says the EK-Vardar EVO family will perform well installed in high-performance air coolers or as case fans for restrictive cases with dust filters, for example. High-static pressure / low noise profile with a 7-blade fan design. High-quality motor and bearing assembly with 50,000 hours life span (MTBF), PWM fan speed adjustment, actively cooled motor windings, and Hydro-Dynamic bearing (only with ER models). 'Timeless design' - so they won't look out of place in any liquid cooling solution. This is another reason for the colour combo choices; single (all black or all white), and two-tone (black with gray blades) models. It will be iteresting to see some tests with different radiators. Maybe they are closer to fill the gap that the GTs left? Friend of mine recently ditched his GTs, in favour of the Corsair ML Pros, as he gets quieter cooling on the wider-spaced rads than any other combination of rad/fan. Depending, these could be very good. I rather liked their 120ER fans!